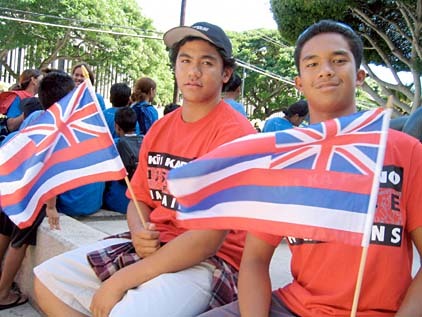 Halau Kumana Charter School students Kawika Santos, left, and Pono Batalona were among those outside federal court yesterday lauding the ruling. A federal judge has upheld the Kamehameha Schools' century-old admission policy, saying the "race-conscious" policy has the legitimate purpose of addressing economic woes and past injustices suffered by Hawaiians. In a 14-page order yesterday, U.S. District Judge Alan Kay struck down a challenge by an unidentified, non-Hawaiian student who argued that the schools' policy of giving preference to Hawaiian students violated federal anti-discrimination laws. "I think Thanksgiving came early for native Hawaiians and all of the people of Hawaii," Kamehameha trustee Robert Kihune said outside the court as a crowd of about 150 Hawaiians and their supporters celebrated. Eric Grant, an attorney for the unidentified student, said he was disappointed by Kay's ruling but plans to file an appeal with the 9th U.S. Circuit Court of Appeals early next year. Kay ruled that the schools' admission policy attempts to remedy past injustices and existing economic imbalances faced by Hawaiians since the overthrow of the Hawaiian monarchy more than 100 years ago. Kay noted that the estate has said that its Hawaiian-preference admission policy is only intended until those imbalances are remedied. He also emphasized that the lawsuit involves "extremely unique circumstances" in that the Kamehameha Schools is a private entity that receives no federal funding. "The court finds that Kamehameha Schools has a legitimate justification for its admission policy and that it serves a legitimate remedial purpose by improving native Hawaiians' socioeconomic and educational disadvantages, producing native Hawaiian leadership for community involvement and revitalizing native Hawaiian culture, thereby remedying current manifest imbalances resulting from the influx of Western civilizations," Kay said. "This court is firmly convinced that the Kamehameha Schools' race-conscious remedial action plan has a legitimate justification." The decision represents the first major courtroom victory in more than three years for advocates of native Hawaiian rights and entitlements, who have been reeling from the U.S. Supreme Court's February 2000 Rice vs. Cayetano ruling, which abolished the Hawaiians-only voting for Office of Hawaiian Affairs elections. It also sets the stage for today's hearing before U.S. District Judge David Ezra on a similar lawsuit brought by Kauai seventh-grader Brayden Mohica-Cummings. Earlier this year, Ezra issued a temporary restraining order forcing the school to admit Mohica-Cummings, whose admission into the schools' Kapalama Heights campus was rescinded after he was unable to show that he was of Hawaiian ancestry. Ezra made no ruling on the estate's admission policy, but said that school officials waited too long to reject the seventh-grader's application. The estate's five trustees, who attended yesterday's hearing with the trust's acting chief executive, Colleen Wong, and Kamehameha Schools Headmaster Michael Chun, said Kay's decision restores hope for Hawaiians. "I can almost imagine our beloved Pauahi smiling down on us today with this decision, and I know that the children of native Hawaiian ancestry are smiling," said Kihune. "And while all native Hawaiian children are smiling, it benefits all of the people of Hawaii." Founded by the 1884 will of Princess Bernice Pauahi Bishop, the Kamehameha Schools is a $6 billion, nonprofit charitable trust that educates more than 4,800 native Hawaiian children each year. Plaintiff's attorney Grant said he believes that Kay will be reversed by the 9th Circuit because the judge's interpretation of federal civil rights laws was overly broad. He said that Kay's ruling does not "mean anything" for the lawsuit he filed on behalf of Mohica-Cummings. During yesterday's two-hour hearing, Grant argued that the Kamehameha admission policy is segregationist and is legal under federal civil rights statutes only if it aims to remedy underrepresentation of Hawaiians within the Kamehameha Schools' student body. "The discrimination in this case is intentional, and they do it openly. ... The defendant's rationale would allow segregated neighborhoods and segregative covenants," Grant said. "This is a categorical racial exclusion. This is segregation." Kamehameha attorney Kathleen Sullivan, who is the Stanford University Law School's dean, argued that the admission policy is justified because it seeks to remedy past injustices, produces racially diverse leadership in the local community and helps to preserve native Hawaiian culture and identity. According to Sullivan, Congress has repeatedly endorsed Kamehameha's efforts to educate children of native Hawaiian ancestry, most recently in the Native Hawaiian Education Act of 2003. Sullivan disagreed with Grant's narrow interpretation of civil rights laws, saying courts have allowed remedial programs such as Kamehameha's admission policy as long as they attempt to address social imbalances such as those suffered by Hawaiians. "If you were born native Hawaiian, you are more likely to be born in poverty. ... If you were born native Hawaiian, you are less likely to be a manager and are more likely to be a laborer," Sullivan said. "What Kamehameha Schools tries to do is bring redress and hope." Yesterday's ruling was greeted with cheers of "imua" and "justice" by members of the Kamehameha ohana. About 150 supporters wearing red shirts assembled on the federal courthouse steps and joined hands with the estate's board of trustees to celebrate. Lilikala Kameeleihiwa, director of the University of Hawaii's Center for Hawaiian Studies, said justice was upheld. "All the people wearing red certainly did influence his understanding of our determination and our pain that these court cases have come this far in the first instance," she said. "For the Hawaiian people it's a great day." Leinaala Naipo-Akamine and Leroy Akamine, both 1952 Kamehameha Schools graduates, said they believe that Kay's decision will set the tone for Ezra's ruling on the Mohica-Cummings lawsuit. "From this day forward, we're confident that all challenges will be denied, our goals and educational missions will be perpetuated so that 70,000 Hawaiian children begging to be touched by the legacy will be touched by it," said Akamine. For Hoku Liu, a 1994 Kamehameha Schools graduate, Kay's ruling means that available spaces at Kamehameha will be set aside for Hawaiians and will not allow others to get in. "I mean, get in line, brah -- there's so many Hawaiians who are trying to get in," Liu said. "It's a dream for families to get in. It's just like getting on a (Hawaiian) homestead."